Cover photograph : John Edginton captured No. 58100 on 31 August 1958 as it drifted light down the incline in a photograph that again gives emphasis to its massive appearance. This photograph shows the locomotive in service during the latter days of its life. We are fortunate in being able to publish (p.14–19) in this issue a sequence of photographs that show its being built in 1919/20. Peter Witts has written an introduction to this and detailed captions for the photographs. 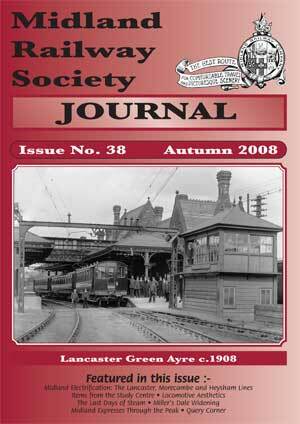 The booklet from which the photographs came is in the Roy F. Burrows collection at the Midland Railway Study Centre. Further information by Peter Witts on the cover photograph is at the bottom of p.13. Cover photograph : Our cover photograph comes from the collection of Midland Railway postcards assembled over the years by John Alsop. 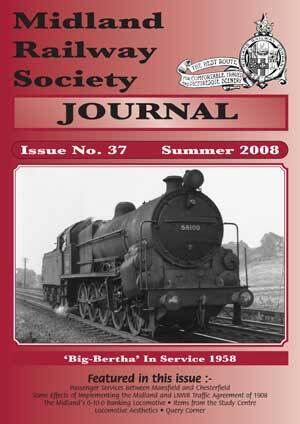 John, working with Roy Burrows, has recently made available copies of these at the Midland Railway Study Centre. There are four in John’s collection that depict work going on for the Midland electrification of the Lancaster, Morecambe and Heysham lines and the subsequent rebuilding of Greyhound viaduct. The article on page 10, and the centre spread are based on them. The cover photograph was taken at the same time, possibly by the same photographer. 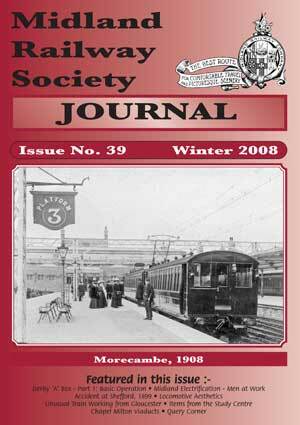 The charming image on the cover shows a three-car Siemens set at Platform 3 of Morecambe station at the end of 1908, the year that the lines were electrified. The leading driving trailer car was No. 2241. Unfortunately, it is not possible to read the numbers of the motor car and the other trailer. Both bow collectors on the motor car were up, and the wind deflectors for each can be seen in the photograph. The ladies ready to board the train were dressed in warm winter clothing, and had clearly spent some money on it. At the time, Morecambe was a place where the wealthy came to spend their leisure time. Other passengers included a bowler-hatted man behind the women, and an elderly gentleman in a naval cap. Back cover : The date (1869) of this form letter about debenture loans makes it unusually interesting. 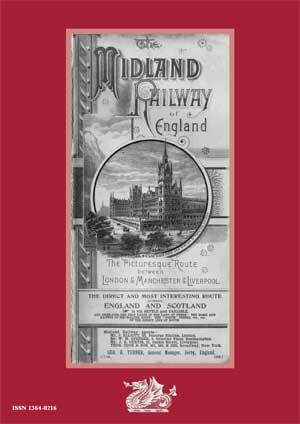 The Midland Railway was financially very extended at that time. The London extension was in place, but it had hardly had time to generate significant new revenue, whilst the Midland Grand Hotel was still being built. 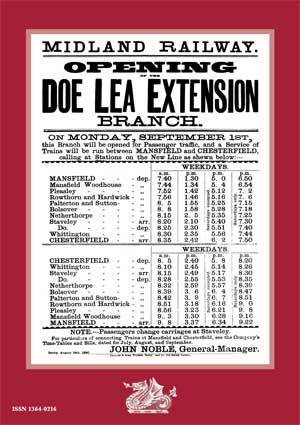 The expensive Chesterfield and Sheffield line was under way, and the cripplingly expensive Settle and Carlisle line had just started. Even though the Midland Railway Company was experienced in riding financial trouble, they needed unprecedented amounts of cash. This letter was part of the essential money-raising activity of the time. Mr. J. Williams, the Secretary of the Midland Railway had written to a Mr. William Simpson of Malton, in reply to his enquiry about loans to the Midland Railway Company. 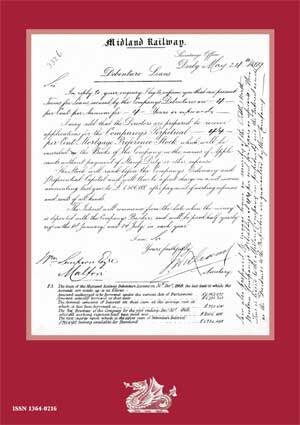 The hand-written note in the right hand margin refers to the (Little) North Western Company (leased in perpetuity to the Midland), and Williams offered debentures against its security giving similar rates of return to the higher Midland debentures.